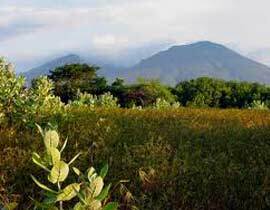 West Bali National Park/ Taman Nasional Bali Barat (TNBB) with an area of 19,000 hectares, spread out in two districts, namely Kabupaten Buleleng and Jembrana district, which can be reached from Denpasar town about 3.5 hours towards Gilimanuk. Cekik city, about 6 km before the city Gilimanuk, Office TNBB / PPA is located, where all the administrative problems to be solved, to get into the area TNBB. Very impressive, no matter a rambling bureaucracy, everything can be solved in a short time. There are two ways to enter TNBB, which can be passed by a vehicle, or a more Adventures, through the path, up and down the mountain, from the Source Klampok Klatakan to Mt. 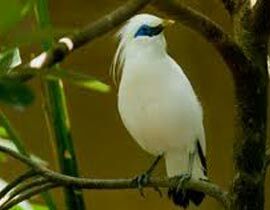 One interesting place to visit is the Bali Starling Bird penangkatan (Leucopsar rothschildi) who supposedly lived only a dozen in number in their natural habitat. We hear that the Bali Starling breeding birds are almost "Extinct" This has been successfully performed by the San Diego Zoo and the Japanese. Even recently, Japan has donated another 24 to ditangkarkan tail Bali Starling in-Indonesia and TNBB get 10 fish quota. Bali Starling bird breeding center which is managed by the Office of TNBB, done Tegal Bunder Postal sector. Bali Starling breeding facility that was almost extinct, which also has become an international concern, it seems inadequate, even a veterinarian visit very erratic. Maybe it is better if the TNBB or Natural Development Center, sending its staff to "comparative study" to the San Diego Zoo as well as Japan, which is certainly more sophisticated all-in all things. The next trip you can continue with Prapat Heading down the coast toward the Great which is located on the edge of the white sandy beach, by the inhabitants called the "old beach", very beautiful. If provided for the tourist beaches of Kuta, the beach seems a long time indeed provided to the (nudist) TNBB residents. To meet the desire of the tourist that do not satisfied, then provided the island. Besides having beautiful beaches, the island where the snorkeling is also very beautiful. If you are lucky, the divers can joke with Dolphins and Turtles. The island is also inhabited by various founa such as deer, Warthog, and others. And, also the choice of the Birds Watcher, which at certain times, can see the waves of migrating birds, from the northern to the southern hemisphere and vice versa. In addition to fauna, in TNBB there are also several types of unique flora, it is said there are only there only, like a thorn tree Crocodile Panggal like the back of a crocodile. This wood is favored by sculptors Ubud, because the groove wood is a rather unique and mystical nuance, but this tree is protected. Trees "lianas" vines or by a resident called the "tree garden" which is no less unique, shaped like a spiral and braid, also highly sought many people to picture frames, this tree is also protected. Tree Sawo Kecik (Manilkara kauki), which is increasingly rare-dibudi also empower the TNBB. According ceritra, fruit Sawo Kecik highly favored by women, especially royal women, supposedly because of properties that can cause a smell that "Seductive" in the body. Post Red Light is the last post you can visit and who were also heading off the coast, only 2.8 kilometers away to the mainland island of Java. Name strangely enough it was taken from the existence of Lighthouse that emit color light reddish. This place is the first landing of Hindus from Java island, the Majapahit era around the 15th century. And, in this place also founded Pura Segara Rupeg that every full moon, much visited by pilgrims. From the land of Bali, looks Mount Merapi (in Java) dominate the panorama, at sunset, the view is fantastic.